Marketing isn’t easy. If you’ve read my post When did estate agents become marketers, you’ll know that I advocate learning how to do it, or else outsourcing it. Yesterday I spoke to a sales agent with four offices in Northumberland; let’s call her Joanne. She has 8 listers in total, with targets of 20 MAs each month – each. Joanne explained that her listers were doing nowhere near their targets, struggling in fact to generate 5 MAs a month each, on average. When I asked her about the methods they were using, Joanne said it was a mixture between canvassing and door knocking, but added that she seriously doubted they were actually doing this. I agreed. You see, Joanne’s listers are salespeople, not marketers. Marketing and selling are two very different skills. To ask a salesperson to generate their own leads is like asking a phone engineer to also do the accounts. It’s just not going to work. So what can Joanne do instead? Together, we mapped out a plan, and I thought I’d share it with you here. First we looked at her current revenue for the four offices. The average commission is £3000, for rounded figures, and the conversion rate from MA to instruction, around 60%. At 40 MAs between them, the listers are generating revenue of £72,000 (excluding any withdrawals), or £864,000 a year. Next, we calculated what that revenue could be if the 20 MAs a month per lister was a reality, or 160 valuations a month. With the same commission and conversion rates, the revenue would be a healthy £288,000 a month, or an impressive £3.5 million a year. Now came my recommendation: hire a full time marketing professional, and give them a realistic marketing budget to manage. 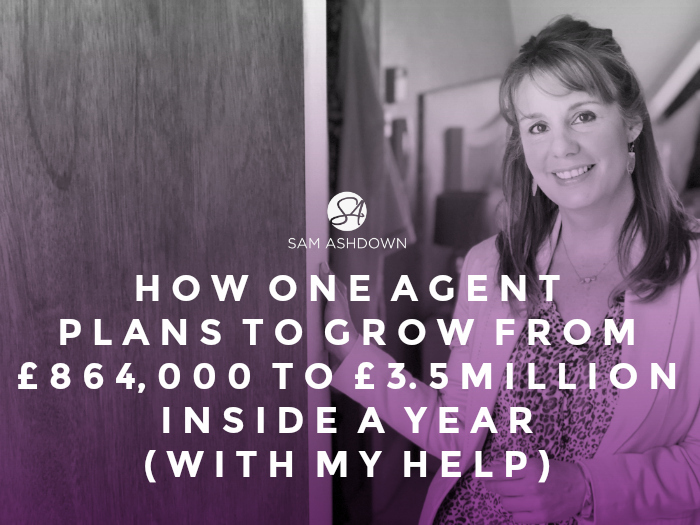 Even at a £50,000 salary, and say £100 marketing budget per market appraisal, Joanne would be spending under £250,000 to achieve a potential £2.5 million plus in revenue. That’s a 10x return on investment. But what if you have a much smaller agency, or you’re a new start-up? Chances are, you can’t afford a full time marketing manager, so what can you do instead? My advice is to start small. Taking the above figures as a guide, Joanne’s new marketing plan equates to £130 per MA. Is that a realistic spend? What’s your return on investment? Let’s say your average commission is only £2000, and you want to win two new instructions per month. You’re new, so your conversion rate may be just 40%. Revenue £4,000 per month, or £48,000 a year. So you pay a marketing assistant £10 per hour, and allocate a further £100 in marketing spend, to generate 5 new MAs a month. Giving you a return on investment of 6x. You can then increase your assistant’s hours, and budget, as you grow and learn what specific marketing tactics work for your area and client base. Does that seem more realistic? Keeping your listers’ diaries fully booked with new market appraisals is your job, as the agency owner, and not the listers’ responsibility. They aren’t very good at it, rarely are they motivated, and it takes their valuable time away from what they should be doing – listing new properties. Can you take 45 minutes to plan your marketing with me? This month, I have five slots available for a FREE 1-2-1 Marketing Planning Session, just like the one Joanne and I did. This is where I’ll sketch you out a marketing plan to get you from where you are now to where you want to be in the shortest amount of time. They’re completely free and take around 45 minutes. If you want to apply for one …..
Next post How much profit do you make?